We provide investors and companies with customer analyses for clients to understand how payor and provider dynamics impact the demand for a company’s products and services. 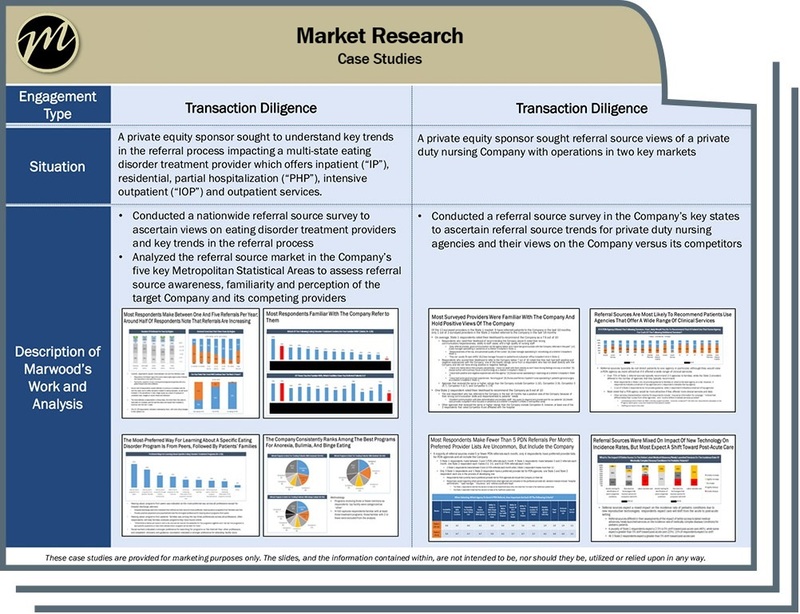 In carrying out its customized market research, Marwood utilizes a network of executives, decision makers and other relevant stakeholders from payor and provider organizations at a national, state and local level to help clients understand the factors shaping customer demand for a company’s product or service. We also conduct referral source and reputation analyses to provide perspective on how key referral sources view a company, as well as the reputation of its competitors. Our team draws on a network of hospital discharge planners, clinicians, practitioners, case managers, and other referral sources to gather insights and perspectives on the key factors which impact where referrals for a particular service or treatment are directed. Insights provided by Marwood typically include views from referral sources on the providers to which they typically refer, criteria for deciding where to direct referrals and brand awareness.